Many readers were enthralled when SF / Speculative writer Jon Courtenay Grimwood entered the Thriller Genre with Moskva, an espionage tale filled with Cold War paranoia and nefarious activity in the former Soviet Bloc. But little would prepare the reader for the follow-up, an excursion into the darkness of an era that still reverberates today. Back in the 1980s with what appears to be a thawing of the Cold War, British Intelligence’s Tom Fox is sent covertly to East Germany (specifically the Soviet controlled sector of Berlin), to ex-filtrate a defector back to the Western sector. As a backdrop to the operation, the geo-political stage is set with the Nuclear Arms negotiations between East and West. As ever and fuelled by paranoia, our Major becomes a Fox on the Run, as the mission takes a curious and dark turn. The target for Fox’s ex-filtration mission, the defector Cecil Blackburn is someone that raises troubling questions back at British Intelligence. There are suspicions raised about his motives for his return to the West. Soon Tom Fox’s inbuilt paranoia becomes real as he finds himself trapped on the wrong side of the Berlin Wall, at the wrong time. Pursued by both sides of the same existential conflict, Fox has to find a way of remaining alive, when so many wish him to vanish, like the Stasi, among other dark agents of the night. The theme of trust is striated throughout the narrative, making us question what is presented to Tom Fox, as is the oppressive claustrophobia that clouds the proceedings. Written in a terse style, not dissimilar to works of Ambler, Littell, and Le Carre; Grimwood’s literary excursions into the espionage sub-genre adds stark fear as his protagonist, starts to resemble Geoffrey Household’s eponymous Rogue Male fleeing from enemies as yet unknown. But it soon becomes apparent that Tom Fox can trust no one; and because of issues in his personal life, especially with Caro (his estranged past love) and Charlie, can he even trust himself? 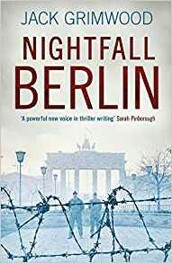 Prescient, and a very fast read, Nightfall Berlin is without doubt a remarkable thriller, but is one that makes the reader think long and hard about life, and death as we accompany Tom Fox as he tries to make sense of what is happening around him; like ourselves in a reality that is as indifferent, as it is malevolent to our presence. It might be sacrilegious, but I consider that the Jack Grimwood’s novels may well overshadow the body of work from Jon Courtenay-Grimwood - in time. Seeking a distraction that will enrich, and enlighten the time away from reality? Then Nightfall Berlin should be packed with the Passport, the sun-screen and that litre of Duty Free Gin - as Grimwood’s latest thriller is just the ticket in these days of fractured geo-politics where truth and lies are interwoven so tightly, that trust becomes a rare commodity.